Can we talk about this for just a minute? Disney is not a new name in comics. Mickey, Donald, Scrooge, the back catalog of titles goes on and on, but the recent launch of the Disney Kingdom line from Marvel has brought Disney stories back to prominence in the comic shop. The first in the line was Seekers of the Weird, based off of Rolly Crump’s original Disneyland concept for a Museum of the Weird. The next entry into the serial and stapled marketplace jumps to the east coast of Disney’s theme park enterprises with a character created specifically for EPCOT Center, Figment. The first issue of Figment, which comes from the minds and pencils of Jim Zub and Filipe Andrade, is due out in June and takes place in Victorian London just after the turn of the century in 1910. The steam isn’t just escaping from the vents in the street, but the steam is also fueling the imagination of inventors in a very steampunk fashion. That may seem like a bit of a stretch, but let’s just be honest, Dreamfinder’s Dream Machine also looked a little more steampunk and a little less functional vehicle of flight, right? 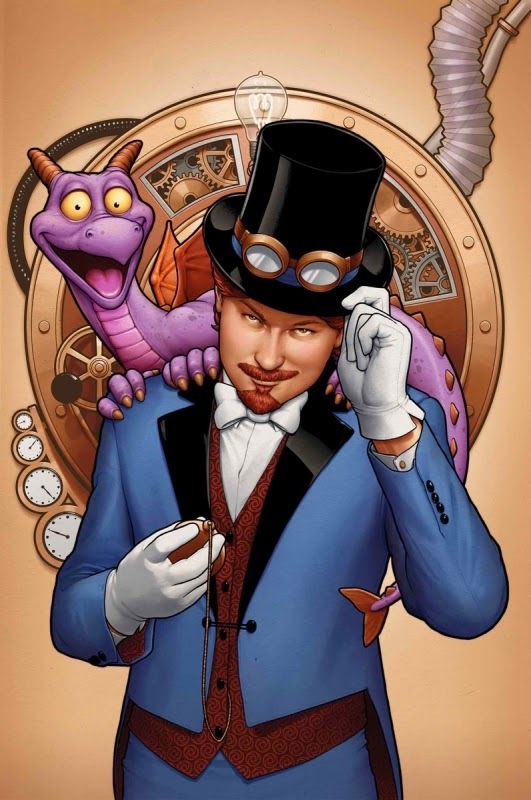 As it turns out, the Dream Machine is the launching pad for Figment and the inventor who will be the Dreamfinder to explore a wide variety of worlds both real and imaginary, fanciful and dangerous. I’m excited that the Dreamfinder will finally have a name, although I’m secretly hoping it will be a play on the first true Dreamfinder’s name, Ron Schneider, but I’m also wondering how a couple of details will play out. No, I’m not concerned about how a character who always seemed like a jovial Santa Claus type is suddenly svelte and has a sense of mystery about him. Weren’t we all a bit slimmer and mysterious when we were younger? My actual apprehension is more focused on the loveable purple and orange dragon. To my mind, Figment was always an on the spot creation of the Dreamfinder during the opening act of Journey Into Imagination. Sure, Dreamfinder’s song could just be describing his best friend, but it always seemed like a spark of inspiration that created Figment in those first few moments we meet the Dreamfinder. The evidence that I have always clung to about this ideal is that just after Figment pops out of his compartment on the Dream Machine and declares how great he is, the Dreamfinder responds with, “Not quite. I’ll throw in a dash of childish delight,” as if to complete the recipe to craft the perfect Figment of the Imagination. Of course, for the sake of one more amazing adventure with the original EPCOT Center duo, I’ll put my concerns away on the shelf and set off for the Dream Port. The terrifying world of literature, the wonderful world of illusions, science, film, space, a land of blank canvases and paper animals, music, stage, and the aforementioned Dream Port. It is only a tip-toe through the tulips of imagination away! June cannot arrive soon enough, and you can bet I’ll be back with reviews as the series unfolds. What about you, are you excited to get a chance to revisit our old friends? I wish it was a cartoon series!